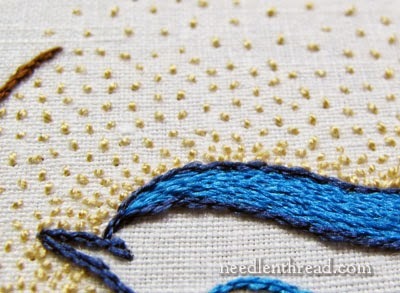 Seed Stitch ... so pretty! Well this weeks stitch of the week is seed stitch, simple but very effective and is brought to you by the ever talented Mary Corbet. I love listening to her when she does her tutorials her voice is calming some how. 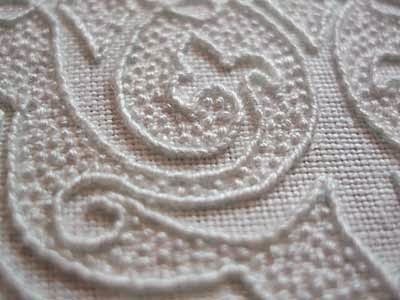 You can use this stitch in so many ways, to fill in outlines and to fill in background where you do not want it to be bare linen. This picture shows what can be done when you use it as a filler for an outline.... I think it is a stunning stitch that is really very simple to learn. The picture on the right is from Mary Corbet and she has used it to fill in a back ground so you can see this is a versatile little stitch and one worth adding to you list of stitches! Well enjoy your watch of the tutorial, make yourself a warm drink and have a few minutes of stitchery pleasure.